Greenfield District is massively being upgraded with high-tech facilities, ultra-modern buildings, and new retail concepts amidst lush green open spaces. MANILA, Philippines - Located at the heart of the major business districts and transport grid, Greenfield District is an oasis amid the city’s hustle and bustle. Strategically located on EDSA in Mandaluyong, the district is a master-planned community comprised of state-of-the-art buildings against lush, green open spaces. It will soon cater to a wide range of needs, and built in an integrated manner, from corporate offices to retail shopping malls and residential towers for a truly smart and connected city living. The 15-hectare complex is planned to have fiber optic infrastructure to keep residents constantly connected to the world via Internet and their own home networks. Greenfield District offers both physical and commercial facilities to maximize accessibility and convenience for numerous workers, current, and future residents. Easily accessible from all over the metro through public transportation and privately owned vehicles, Greenfield can be easily navigated with speed and efficiency, through its masterfully planned interconnected subterranean basement road networks. The ultra hi-tech Twin Oaks Place, a premiere condominium with state-of-the-art features, marks the beginning of a future-ready lifestyle, thus Greenfield District is massively upgrading its retail complex to accommodate the needs of its growing community with retail establishments and various shops through the new retail zone, The Portal. The Portal will complement Greenfield District’s existing shopping and dining centers — the Pavilion, Square, Station, and IT Center, and the newest dining strip, The Hub. A significant retail component in Greenfield District, The Hub will be the center of activities catering to city dwellers. With all a wide range of bars and restaurants within their reach, The Hub will the one-stop destination for all the excellent dining, cafés, and partying venues amidst a green, relaxing ambiance, with a refreshing view of the central park. Have a taste of what The Hub has in store: Uncle Cheffy, famous for its oven-baked panizza, barbeque, and ribs; Kanin Club with their sumptuous spin on classic Filipino dishes; and the French bistro-inspired Blackwood Bistro, serving up all-natural, straightforward yet flavorful dishes. Tea lovers will surely welcome extraordinary tea concoction and light snacks at Serenitea or the delicious crepes and divine desserts at Café Breton. Other gastronomic delights include Uno Pizzeria, offering a fusion of American, Italian, Oriental cuisine and innovative pizza flavors. For a zesty refreshing break, try the healthy fruit shakes and juice blends at Pump Juice Bar, or have great teatime at Y-Tree Milk Tea. Opening soon to satisfy your cravings is the popular Brother’s Burger with its mouth-watering, flame-grilled gourmet burger. With all these options, you are sure to have a delightful dining experience by the greens! Truly, The Hub at the Greenfield District is a quick escape from the city, within the city. 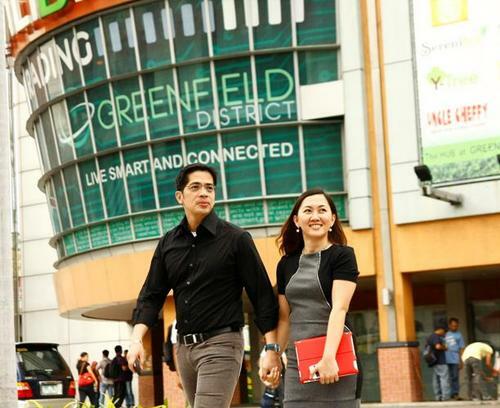 With the integration of residential and retail areas, Greenfield District has taken this concept further with its advanced interconnectivity, future-ready facilities, parks and open spaces, and keen appreciation of consumer needs.